A fixed window is one that does not open. Such windows allow light to enter but do not open. They are often installed in inaccessible areas, such as high on a wall. 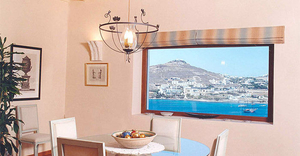 As picture windows, they improve views of a structure's surroundings and increase the feeling of interior spaciousness. Choice will depend on thermal and acoustic insulation qualities, such as double or triple glazing, and argon gas between the panes. Other factors include ease of maintenance and security, which can be improved by use of laminated or tempered glass. Aesthetic factors include: shape, size relative to the environment and frame color. Applicable local regulations should be observed.